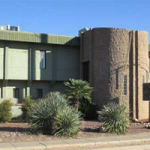 TUCSON, AZ- In September, Arroyo Amarillo LLC (Gary and Lori Oschmann) purchased 1037 S. Alvernon, a +/- 10,529 SQ FT space from Western Alliance Bank out of Las Vegas for $590,000 ($56 PSF). According to Gary Oschmann, the space will be utilized by Oschmann Employee Screening Services (OESS). In business for 19 years, OESS is a national provider of drug and alcohol testing, employee background, and Department of Transportation compliance services. OESS, which currently employs 14, outgrew its current office at 3360 S. Palo Verde Rd. Oschmann anticipates hiring in the coming months and years. After remodeling, Oschmann will relocate OESS to the new facility by the end of the year. Before selecting 1037 S. Alvernon, Oschmann says he considered a half a dozen locations in the industrial district of Tucson. Tom Hunt and Bob Davis from Tango Commercial Real Estate represented the buyer while David Montijo, Jeff Casper and Damian Wilkinson of CBRE represented the seller. “Tom from Tango looked at availability for both leasing and purchasing that met all of our requirements and brought us the best options. He walked us through the process and when we decided on the best option he helped us select the best vendors for financing, inspections, and construction,” Oschmann said. For additional information Hunt and Davis can be reached at 520.288.1231. Montijo, Casper and Wilkinson should be contacted at 520.323.5100. To learn more see RED Comp #3266.